Cuba May Allow Baseball Players To Play In Other Countries Professionally; But Not In The U.S.
Adam Fusfeld | Dec. 28, 2010. The Baseball Federation of Cuba, headed by Fidel Castro's son, wants to allow baseball players to play elsewhere in exchange for a portion of their salary, rather than continue to be embarrassed by high-profile defections, Yahoo! Sports reports. While MLB teams have shelled out more than $75 million to Cuban transplants over the past 24 months, they could not operate lawfully under those circumstances considering the longstanding U.S. embargo on Cuba. 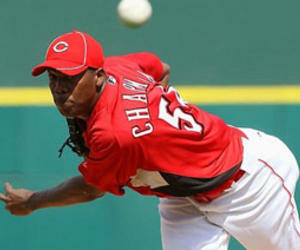 Cuba is more likely to reach that agreement with professional leagues in Japan, South Korea, and Mexico. Their leagues pay significantly more than the few hundred-to-several thousand dollars Cuba pays. However, because of the high salaries that MLB teams have paid to Cuban players like Aroldis Chapman, Kendry Morales, Jose Contreras, and Alexei Ramirez, they will still be drawn to the U.S. So unless Cuba allows the free movement of its players, a new policy is unlikely to curb defectors.